Just like humans, dogs want variety too! 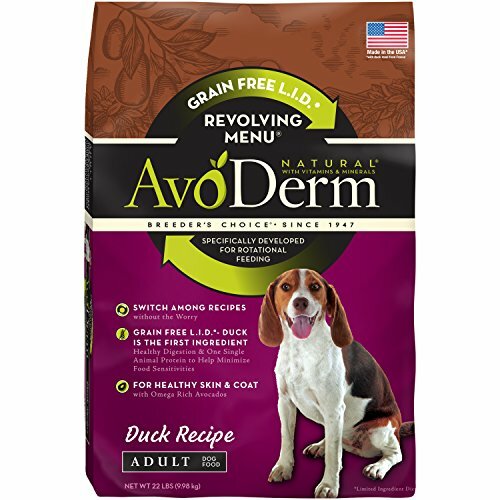 Serve up some protein variety with AvoDerm Natural Revolving Menu duck recipe adult dry dog food without worrying about upsetting your dog's stomach. AvoDerm Natural Revolving Menu dog food was created especially for dogs with sensitive stomachs. When your dog has food sensitivities or a potential food allergy, knowing exactly what’s in their food is important. Luckily, our limited ingredient diet adult dog food recipes make it simple to know you're feeding your dog all natural premium ingredients. We keep our list of ingredients short to ensure only high quality proteins and essential vitamins and minerals are provided in your dog's diet. Try feeding your dog all of our nutritious recipes in rotation without the worry of an upset stomach. When feeding AvoDerm Natural Revolving Menu dry dog food, you can choose to feed just one recipe or any combination of recipes on the menu. These recipes were specifically formulated for the option of rotational feeding, so you can feel confident about giving your dog "variety." Real duck is used as the #1 ingredient in this recipe to ensure each serving is filled with the ideal proteins to keep your dog healthy and active. We then compliment these flavors with the omega-rich California grown avocados. These nutrient dense superfoods help promote good health and healthy skin to keep your dog's coat shining all season long. Lastly, we incorporate two unique carbohydrate sources, garbanzo beans and peas to keep our recipe grain free and gluten free. Specially crafted for adult dogs, our dry dog food is pressured cooked ensuring each bite is filled with the essential vitamins, minerals and antioxidant nutrients to support a healthy immune system. Our formulas never include any meat-by-products, artificial flavors or preservatives. No wheat, no corn and no soy. Serve your dog our limited ingredient diet grain-free dry dog food with real duck to provide the essential nutrition your dog needs. If you have any questions about this product by AvoDerm, contact us by completing and submitting the form below. If you are looking for a specif part number, please include it with your message.